Have you ever wondered what happens to the wood chips and bark from lumber mills? What about the manure from livestock operations? Well, these are actually considered renewable bio-energy sources and can be put to use or serve as recycled biomass energy supplies. When these biomass supplies are burned in an appropriate manner, they make a great deal of electricity. In fact, many people are already familiar with the site of a flame coming out of the top of an old landfill, and interestingly enough they are probably watching recycled biomass energy production at work. 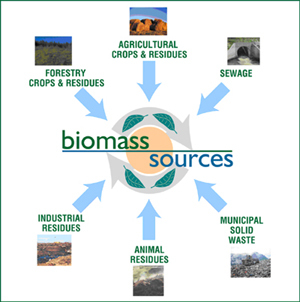 Renewable bio-energy currently includes dead trees and branches, left over portions of major crops (such as corn stalks), wood chips and sawdust, used tires, manure, paper products that are not recyclable, and even grass clippings. These are all transported to a recycled biomass energy plant where the materials are dumped into something known as a “hopper”, which then sends the materials into a massive furnace. This furnace burns at a very high temperature and is used to convert water into steam inside of a “boiler”. It is the steam from this massive boiler that turns the turbines and creates energy from “garbage”. It is important to note that it is not environmentally friendly to burn just anything, and most recycled biomass energy can come only from renewable bio-energy supplies. These are things that can be grown and created over and over without depleting natural resources to obtain them. Consider that oil supplies and coal supplies are actually only a limited resource. Eventually the world will run out of these materials. On the other hand farmers will always be growing corn, and trees never stop reproducing. These materials are safe to burn in a recycled biomass energy plant because they contain no chemicals or damaging materials, though burning itself is not the best way to create energy of any kind. Burning renewable bio-energy sources, however, is far superior to other materials. Another interesting discovery occurred thanks to the recycled biomass energy movement, and that was the production of ethanol from such materials as corn. This is now being put to use in many vehicles, where it is combined with gasoline and produces a highly effective fuel. The entire point of the recycled biomass energy industry is to reduce or entirely eliminate the human need for fossil fuels which are destroying the environment and threatening the future. This entry was posted in News and Society on November 28, 2013 by admin_z.